So I have cupcakes and free stuff for you today! CUPCAKES and FREE STUFF (Specifically a chance for a Kitchen Aid Mixer and some really fun Cupcake Supplies)?? AND a fun SCAVENGER HUNT! What is this madness I speak of? Well first off, the cupcakes (hang with me to get to the awesome free giveaways). 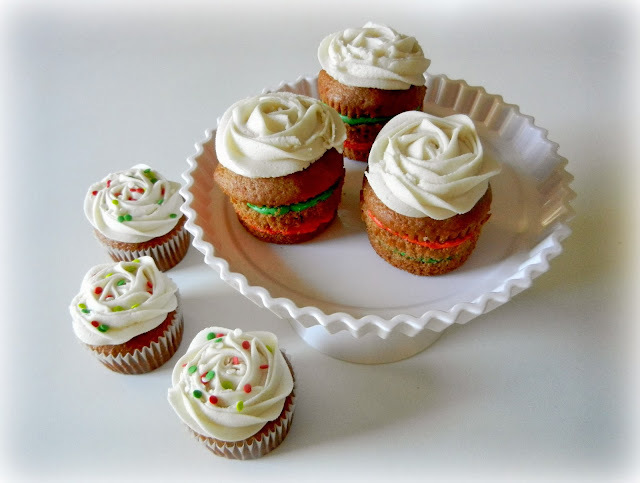 One of my most popular posts of all time (well of all my blogging time anyway) are these striped layered christmas cupcakes. If you look at the pics you will see they are one of my first posts, a throw back to 2010! In blog years, that's pretty much like 20 years. But I really appreciate all the viewing, sharing, featuring, pinning, and especially the links back that many of you all have done with them, so to thank you, I did another layered cupcake and giveaway for you (be patient that's coming soon!). 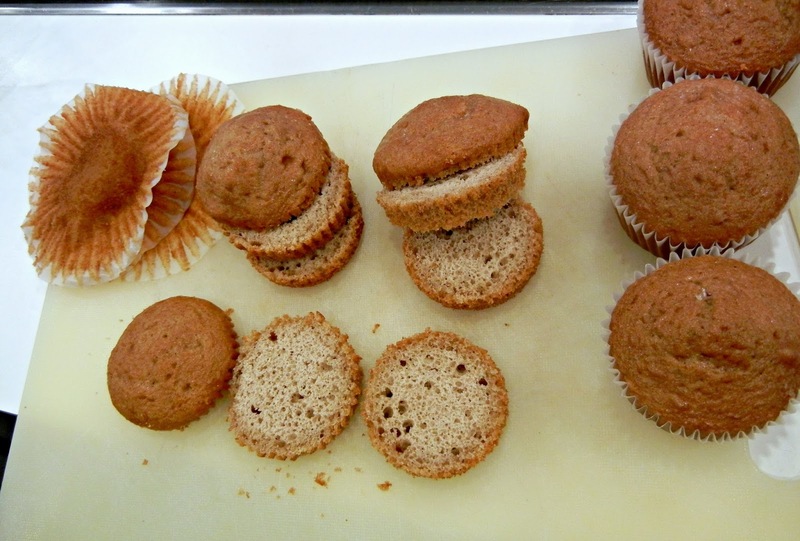 This one is a spiced cupcake (from a box mix). To make slicing the cupcakes much easier on you. Freeze them. Like for awhile. Overnite if you can. Then use a serrated knife and cut layers into equal sizes. Add your favorite frosting. I used vanilla buttercream tinted red and green and added some between the layers. 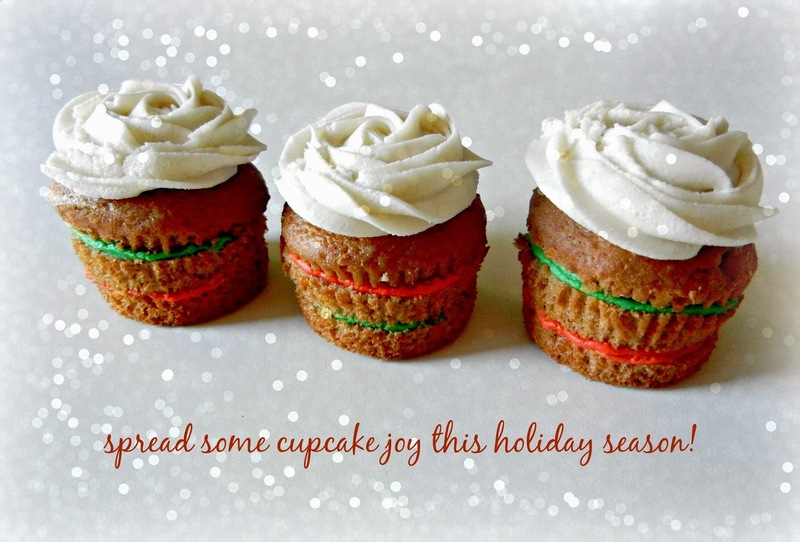 Depending on how much you like frosting you can add a thick layer or go with thin layers. Then frost the top - I went with a simple rose design using the 1M wilton tip. OR if you don't like the layered look, you can just pipe the roses on top and add some fun sprinkles. Sprinkles always win. Always. But you can add a surprise and add some tinted red, white, and green icing inside too. Way more fun. NOW onto the FREE STUFF! Well some chances for free stuff! Karyn from Pint Sized Baker and Dieter's Downfall organized this super fun Christmas Favorites Giveaway and Scavenger Hunt with a bunch of us. There are 2 giveaways, and a scavenger hunt! 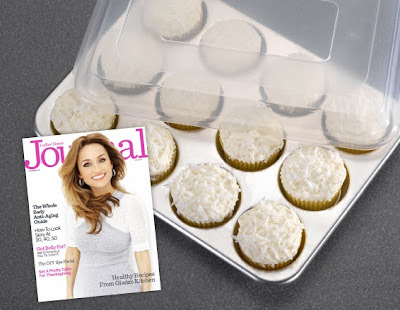 First, some really cool CUPCAKE SUPPLIES from yours truly and Ladie's Home Journal. LHJ is offering 2 of their favorite cupcake pans by Nordicware (worth $29 each) and a subscription to LHJ for one year for you and a friend! And I also have some really fun cupcake supplies that I love and hope you will too. You get 2 of these Nordicware and a subscription to LHJ for you and a friend!! Yep you read it right a KitchenAid Pro Mixer! Woohoo! AND for the SCAVENGER HUNT! One way to enter the giveaway is to visit all the blogs for a scavenger hunt to decode the Secret Holiday Message. 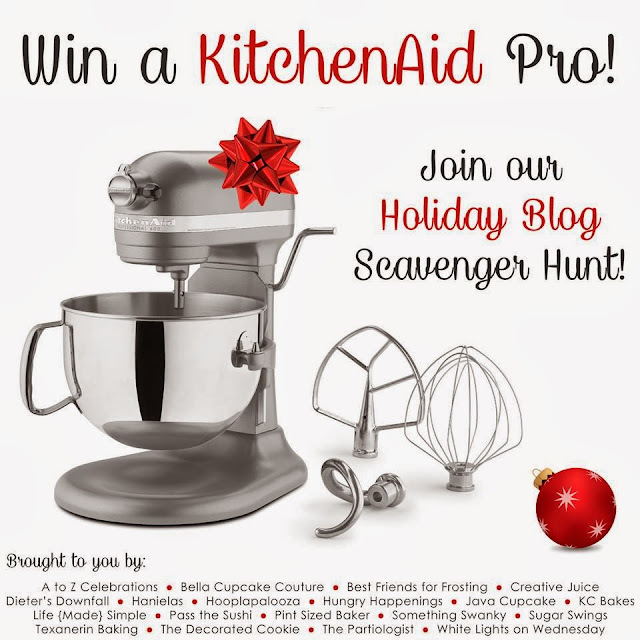 When you visit all 19 blogs, you'll have to put the words in order to decode the Secret Scavenger Hunt message and enter to WIN the KitchenAid Professional Mixer! Record this word and head over to Nancy over at A to Zebra Celebrations for the next clue. Here are all the FB pages to make it even easier for you! A ginormous thank you to Karyn for organizing ALL of this, so many emails, FB messages, and even a Google Chat late last nite! And please be sure to visit all the other amazing blogs sponsoring the Kitchen Aid Pro giveaway as well as their own giveaways (meaning potentially more free stuff!). We are all doing this for our awesome readers and to say THANK YOU to you all this holiday season. The links are below! You better watch out, you better not cry, better not pout i'm telling you why - Santa Claus is coming to town! You better watch out, you better not cry, you better not pout, I'm telling you why, Santa Claus is coming to town! You better watch out, you better not cry, better not pout I'm telling you why Santa Claus is coming to town! Love that you guys were all able to come together for such a fun give-a-way! Love all the amazing giveaways and the fun products! It's the Santa Calus is coming to town song!!!! :) You better watch out, you better not cry, better not pout, I'm telling you why- Santa Claus is coming to town!!! You better watch out you better not cry better not pout I'm telling you why Santa Claus is coming to town. I would make cake and cookies for the holidays with the mixer! You better watch out. You better not cry. Better not pout I'm telling you why. Santa Claus is coming to town. Your cupcakes are genius! Totally solves the whole "too dry" cake part! Thanks for such a fun post and great contest. You better watch out, you better not cry, you better not pout, I'm telling you why, Santa Claus is coming to town! You better watch out you better not cry you better not pout I'm telling you why Santa Claus is coming to town! Thanks for this great giveaway. Good luck everyone. If I won the mixer, I would make all sorts of goodies...cookies, brownies, cupcakes. Thanks for the giveaway. Good luck everyone. Love this blog! Amazing tips. Oops - I think you got confused & got the questions switched on your rafflecopters? You asked for the scavenger hunt question to posted when it should have been put into the rafflecopter. I don't want to spoil the scavenger hunt by posting the answer here (That's what the Cupcake Baking Supplies Rafflecopter requested). I'll just say it starts with "You" and ends with "Town." It definitely has to be chocolate! My favorite cupcake flavor is red velvet! vanilla cupcakes are my favorite! I love a classic vanilla cupcake with coconut frosting, but recently made pumpkin cupcakes with maple cream cheese frosting and a caramel drizzle that were out of control! Merry Christmas!! I'd LOVE to win the mixer!! My favorite cupcake is pumpkin spice with cream cheese flavored buttercream. yum!! My favorite cupcake is yellow with chocolate frosting. Chocolate is my favorite for both the cupcake and the icing. Chocolate cupcake are my favorite. Thanks for the giveaway. I would be giving everyone cupcakes for Christmas! And by that I mean, I'd be giving them my favorite: chocolate cupcake with peppermint buttercream frosting. My favorite anything is chocolate. My most favorite kind of cupcake, hands down, has to be chocolate. NOT out of the box chocolate. Rich, decadent, coffee flavored chocolate. If I had to add a frosting it would probably be cookie dough frosting. Who doesn't love that? I absolutely love vanilla bean cupcakes, I'm a purist! My favorite cupcake flavor is lemon. My favorite is red velvet! My favorite cupcake flavor is chocolate. Love the rose top! Cute idea! Chocolate will always and forever be my favorite cupcake, cake, whatever flavor. Err day. Chocolate frosting, chocolate cake. Yes please. Right meow. O love a good pure vanilla cupcake. My favorite cupcake is a yellow cupcake with chocolate icing. Classic! my favorite cupcake is a chocolate Guiness Stout cupcake with Baily's Irish Cream icing. soooo decadent!! Glad to have found your blog...pretty cool stuff and inspiring!! My favorite cupcake flavor is snickerdoodle!!!! My favorite cupcake flavor is carrot cake with cream cheese frosting! Favorite cupcakes care definitely Limoncello! They are divine! My favorite cupcake flavor is vanilla malt. I pumpkin cupcakes with maple cinnamon cream cheese frosting. My favorite cupcake flavor is strawberry! My daughter needs your cupcake recipe book. She only makes things that have a photo. Ha! Salted caramel cupcakes are my fave! Would love to win all the wonderful goodies. If I have to choose one flavor of cupcake it will have to be orange dreamsicle. Yellow cupcake with chocolate frosting!! My favorite flavor is chocolate with cream cheese frosting, although I love the red velvet ones too. Red velvet with cream cheese! Dark chocolate is my favorite flavor! My favorite cupcake flavor is the classic red velvet! I love chocolate or Red Velvet!! Mocha cupcakes are my favorite! I would definitely make Christmas cookies :) 'Tis the season! This has been wonderful, I have found so many great ideas! My favorite cupcake flavor is Chocolate! 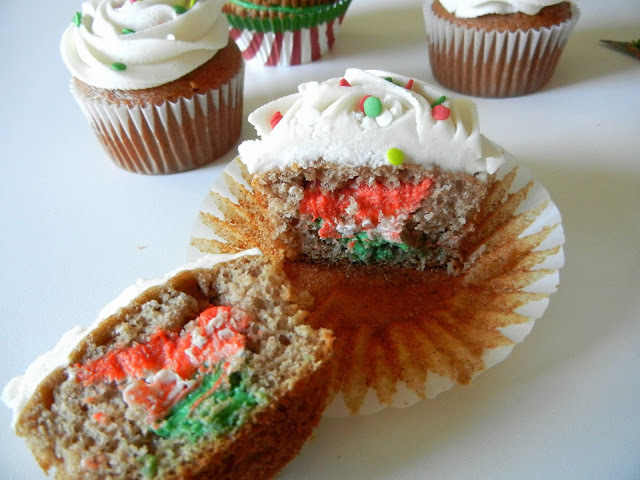 And for this time of the year, I'll take some peppermint frosting to go along with the chocolate cupcakes! My favorite cupcake flavor is lemon blueberry with a cream cheese frosting! Yum! so many spoilers! I love chocolate with cream cheese frosting ..simple and yummy! What a question, how can you pick just one. When it comes to a cupcake, ANY flavor is good. Cardamom is a favorite I have yet to bake. I haven't made any in my place for lack of supplies. Nudge. Will be using some of these great recipes for my Christmas baking! Strangely I love strawberry and raspberry flavors in cupcakes the most! I prefer vanilla cake with vanilla frosting. I love cupcakes. They are the most awesome thing ever. My favorite cupcake flavor is chocolate. Then spice, pumpkin, vanilla, banana, lemon.... I don't think I've ever met a cupcake flavor I did not like. I like Red Velvet Cucakes! I would make some chocolate chip cookies with the mixer! Being the traditionalist that I am, I would say that vanilla would be my all time favorite cupcake flavor. 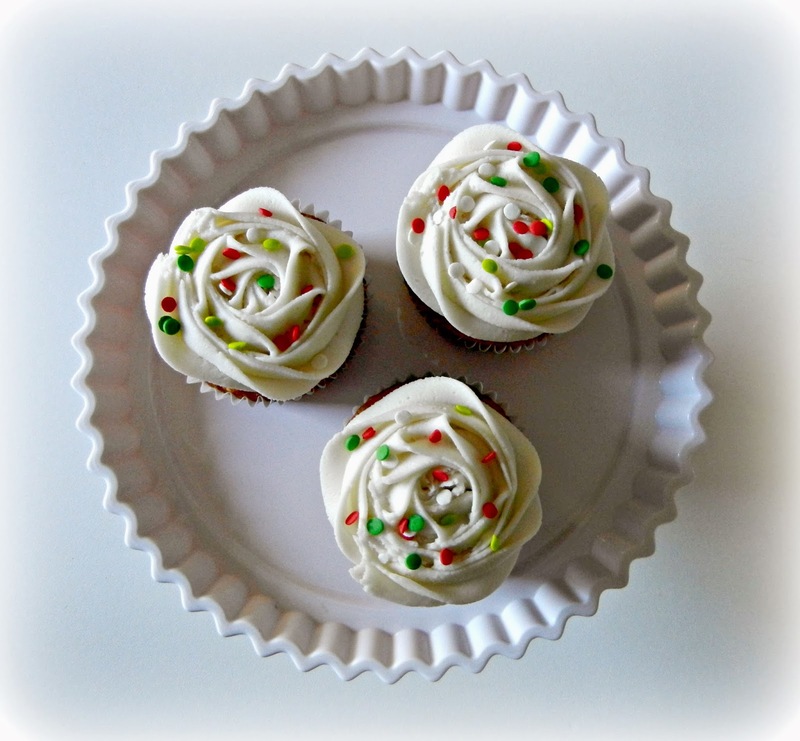 I am a simple girl I love vanilla cupcakes with a rich fluffy icing of any kind! My favorite cupcake is the classic vanilla. Those look so delicious and adorable! Happy to participating in this blog party giveaway with you!